- June 2018 - Conversion of the VHF antenna at the Townsend site to a VHF/UHF antenna system, with the addition of a UHF receiver to support NCSO radio communications (talk-back). - October 2018 - Implementation of a fifth transmitter for the EMS Operations Channel (part of simulcast channel) at the Chincoteague communications tower; designed to improve talk-out coverage in northern Accomack County (funding primarily with state RSAF grant funds and some local funding). - 2017/2018 - New generators installed at the ACSO, Chincoteague, and Cape Charles communications towers (to provide emergency back-up support during commercial power failure). The Eastern Shore of Virginia 9-1-1 Commission contracted with Motorola Solutions to install a reliable and system-stable solution to facilitate the handling and processing of emergency calls to its regional 9-1-1 public safety answering point (PSAP) designated as the Eastern Shore of Virginia 9-1-1 Communications Center. Motorola installed its Emergency CallWorks solution in September 2016. The system provides telephony and other call handling solutions including integrated mapping. Request for Proposals - #911-16-001 Emergency Call Handling Equipment - Contract Awarded to Motorola Solutions, Inc.
· SYSTEMWIDE NARROWBANDING AND RADIO REFRESH. SYSTEM NARROWBANDING COMPLETED DECEMBER 2012. COMMUNICATIONS INFRASTRUCTURE WORKGROUP (CIW) SET STANDARDS AND COORDINATED PLANS. RCC CONSULTANTS, INC., PROVIDING CONSULTING SERVICES TO COMMISSION AND CIW; RADIOS SELECTED FOR PURCHASE UNDER GRANT, SUMMER 2012; AGENCY ORDERS OF FIELD RADIOS RECEIVED AND PROCUREMENT COMPLETED THROUGH DELMARVA TWO-WAY RADIO, INC., SUMMER/FALL 2012; INFRASTRUCTURE REPLACEMENT RADIOS AND SYSTEM UPGRADES COMPLETED BY ATLANTIC COMMUNICATIONS, FALL 2012; BROADBAND BACKBONE IMPLEMENTATION AND TESTING IN BETA STAGE. TOWER WORK COMPLETED AT SOME SITES AND IN PROGRESS AT OTHERS. 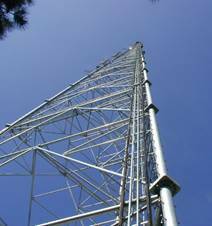 · RELOCATE SELECTED RADIOS FROM PUBLIC SAFETY TOWER AT ACCOMACK SHERIFF'S OFFICE TO STARS TOWER ACCOMAC. SIRS, 800 MHz NPSPAC. INSTALLATION OPTIONS TO BE DETERMINED BY FUTURE SYSTEM NEEDS AND COMMUNICATIONS INFRASTRUCTURE WORKGROUP (CIW). · An additional call taking position with full 9-1-1 capabilities was added in the supervisor’s office to permit expanded telephone processing operations when warranted. 9-1-1 telephone system software was upgraded for all positions. NOW ACTIVE. · A third MCC5500 communications console was added to expand operational capabilities for radio dispatch in the communications center. MCC5500 software was upgraded in conjunction with the installation. NOW ACTIVE. PROJECT 1: This project provided for reception of talk-around traffic in the northern and southern Accomack tactical zones. · F3 RECEIVE ENHANCEMENT FOR FIRE/EMS DISPATCH AND RECORDING: Added voting receiver at Mappsville for talkaround frequency for F3. 911 Center will receive voted audio from either Accomac control station receiver or Mappsville voted receiver (repeater output and talkaround voted). NOW ACTIVE. · F7 RECEIVE ENHANCEMENT FOR FIRE/EMS DISPATCH AND RECORDING: Added voting receiver at Craddockville for talkaround frequency for F7. 911 Center will receive voted audio from either Accomac control station receiver or Craddockville voted receiver (repeater output and talkaround voted). NOW ACTIVE. PROJECT 3: This project expanded the mobile and portable talkback range for the subject repeaters and enhanced reception through voting of multiple receive sites. · F7 RADIO SYSTEM UPGRADE FOR FIRE/EMS (MOBILE INPUT TO REPEATER): Installed comparator at F7 repeater in Belle Haven, installed SQM's, connected receiver, connected remote receiver circuit, calibrated, tested, activated. Replaced site antenna 2/11/09. NOW ACTIVE. · F3 RADIO SYSTEM UPGRADE FOR FIRE/EMS (MOBILE INPUT TO REPEATER): Installed comparator at F3 repeater in Mappsville, installed SQM's, connected receiver, connected remote receiver circuits, calibrated, tested, activated. NOW ACTIVE. · INSTALLED REMOTE VOTING RECEIVERS FOR F3 AND F7: Installed voting receivers at the VSP STARS tower site in Accomac. Connected to provided antenna ports and to telephone circuits for routing to repeaters at Belle Haven and Mappsville. NOW ACTIVE. PROJECT 4: This project expanded the mobile and portable talkback range for F1 and F11 (dispatch reception only) and F3 (repeater input), and enhance reception through voting of multiple receive sites. · IMPROVED 911 CENTER RECEPTION OF F1 RESCUE DISPATCH AND F11 TACTICAL FROM NORTHERNMOST ACCOMACK COUNTY: Installed voting receiver for F1 AND F11 at NAVY tower, Wallops Flight Facility, in northern Accomack County. Antenna installed. NOW ACTIVE. 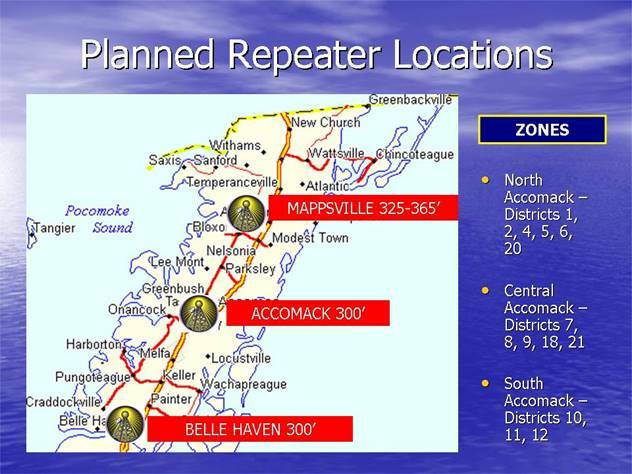 · F3 RADIO SYSTEM UPGRADED FOR FIRE/EMS (MOBILE INPUT TO REPEATER) FROM NORTHERNMOST ACCOMACK COUNTY: Installed voting receiver for F3 at NAVY tower, Wallops Flight Facility, in northern Accomack County. Antenna installed. NOW ACTIVE. PROJECT 5: Resolved reception of foreign traffic on F5 repeater output frequency. For long-term resolution, CIW will need to consider reprogramming/licensing options resulting from shared channel usage. · F5 RECEIVE ENHANCEMENT FOR FIRE/EMS DISPATCH AND RECORDING: Resolved reception of foreign traffic on repeater output frequency/PL. Rewired repeater for direct control rather than by control station. NOW ACTIVE. PROJECT 7: A paging transmitter was installed at Mappsville in May for interim use and systems testing, and is now active for use. Required approval by Infrastructure Work Group and other entities. · Improved Paging Output in Northernmost Accomack County: Added F1 Base Station or Repeater in northern Accomack County to support paging coverage in northernmost part of County. NOW ACTIVE. PROJECT 10: Establish back-up systems for radios and telephones (9-1-1 Center). · PROCURE AND INSTALL BACKUP REMOTE TO ALLOW PAGING AND BASIC COMMUNICATIONS IN EVENT OF MCC5500 FAILURE. Primary channel controls for F1 and F2, perhaps additional channels. NOW ACTIVE. · INSTALL BACKUP TELEPHONES AND/OR RADIOS AT OFFSITE BACKUP LOCATIONS. NOW ACTIVE. · REPLACED SELECTED WIDEBAND EMS VHF (T55R) AND UHF MED RADIOS AT ACCOMAC (RSAF GRANT). New radios installed at STARS Accomac. NOW ACTIVE. PROJECT 12: This project expanded the receive footprint and added additional reception range for portable reception by the 911 Center for F12. · F12 RECEIVE ENHANCEMENT FOR FIRE/EMS DISPATCH AND RECORDING – MAPPSVILLE RECEIVE SITE: Reprogrammed new voting receiver to receive frequency for F12 and for SpectraTac operation. Installed in existing cabinet at Mappsville, connected antenna port to VHF multicoupler, connected to Verizon telephone circuit at site, connected circuit in 911 Center to comparator/SQM for F12 on wall at ESVA911. Center will receive voted audio from either Accomac, Cheriton, Mappsville, or Craddockville voted receivers. Changes from voting two sites to voting four sites. NOW ACTIVE, BUT RECEIVING SOME FOREIGN TRAFFIC ON DEDICATED CTCSS SYSTEM. · F12 RECEIVE ENHANCEMENT FOR FIRE/EMS DISPATCH AND RECORDING - CRADDOCKVILLE RECEIVE SITE: Reprogrammed new voting receiver to receive frequency for F12 and for SpectraTac operation. Installed in existing cabinet at Mappsville, connected antenna port to VHF multicoupler, connected to Verizon telephone circuit at site, connected circuit in 911 Center to comparator/SQM for F12 on wall at ESVA911. Center will receive voted audio from either Accomac, Cheriton, Mappsville, or Craddockville voted receivers. Changes from voting two sites to voting four sites. NOW ACTIVE, BUT RECEIVING SOME FOREIGN TRAFFIC ON DEDICATED CTCSS SYSTEM. · PROCURE AND INSTALL EMS MED RADIO FOR NORTHAMPTON COUNTY. NOW ACTIVE; MED 8 (UHF CHANNEL PLAN CHANNEL 28). · RELOCATED VHF LEGACY RADIO AT CHERITON FROM OLD VSP TOWER TO STARS TOWER (EASTVILLE/CHERITON). Converted link to all microwave for circuits from Cheriton to Accomac. NOW ACTIVE. • Currently studying the potential to establish and operate one or more dedicated EMS Response channel(s) to allow EMS units to communicate on a channel other than the channel used for paging and alerting. Activated F11 for this purpose in Accomack County on February 1, 2009, but later reverted.